ALEPPO, Syria Most of the rebels fighting government forces in the city of Aleppo fit a specific mold: They're poor, religiously conservative and usually come from the underdeveloped countryside nearby. They bring to the battle their fury over years of economic marginalization, fired by a pious fervor, and they say their fight in the civil war is not only against President Bashar Assad but also the elite merchants and industrialists who dominate the city and have stuck by the regime. The rebels regard this support for the government to be an act of betrayal. The blend of poverty, religious piety and anger could define the future of Aleppo, and perhaps the rest of Syria, if the rebels take over the country's largest city, which is also its economic engine. They may be tempted to push their own version of Islam, which is more fundamentalist than what is found in the city. Their bitterness at the business class may prompt them to seek ways of redistributing the wealth. "Those who have money in Aleppo only worry about their wealth and interests when we have long lived in poverty," said Osama Abu Mohammed, a rebel commander who was a car mechanic in the nearby town of Beyanon before he joined the fight. "They have been breast-fed cowardice and their hearts are filled with fear. With their money, we could buy weapons that enable us to liberate the entire city in a week," he said. Video: Syria: Are Islamist militants taking over anti-Assad rebellion? With neither side able to decide the battle after three months of fighting and with winter fast approaching, however, the rebels from the countryside in Aleppo province risk losing the popular good will they have enjoyed from their fellow impoverished Sunnis in the city. On Saturday, civilians pelted a group of rebels with broken glass as they headed to the front line because they feel the fighters' presence brings the regime's destruction down on them, according to an Associated Press photographer and cameraman who witnessed the incident. "The city of Aleppo has not really joined the revolution," acknowledged one 32-year-old fighter who goes by the name of Abu Ahmed and is from the nearby town of al-Bab. "All of us are from rural Aleppo." Like some other rebels, he spoke on condition he be identified only with that nickname  by which he is widely known among his comrades  fearing that use of his real name could bring retaliation on his family. The battle for Aleppo is a stark illustration of how Syria's conflict, now in its 19th month, is as much a revolt of the underclass as a rebellion against the regime's authoritarian grip. The countryside surrounding Aleppo is dotted with small farming towns where the population is overwhelmingly Sunni Muslim, with a social fabric built around strong family and clan ties, primarily guided by local customs and a conservative brand of Islam. In contrast, Aleppo's estimated 3 million residents are a mix of Syria's main ethnic and religious groups  Sunni and Shiite Muslims, Alawites, Christians, Kurds, Turkomen and Armenians  with a relatively liberal lifestyle. The northern city is home to a powerful community of factory owners, manufacturers and merchants, mainly from prominent Sunni families, who were largely allowed to operate without government interference while the Assad family's Alawite sect, an offshoot of Shiite Islam, kept its grip on political power. The flashpoints of the uprising have been the poorest parts of the country. It began in March 2011 in the impoverished southern province of Daraa. A drought hitting parts of the country displaced tens of thousands of people from farming areas, putting more pressure on the economy. The city of Homs, which has been a main center of the rebellion, is known as "the mother of the poor" because the cost of living is lower and its population generally less well off. When Damascus saw its worst fighting yet in July, it was largely in the capital's poorer districts that the rebels operated. The gap between rich and poor across Syria grew in the more than a decade of free market economic policies initiated by the late Hafez Assad and accelerated by his son, Bashar, when he took power in 2000. Focused on the service sector, the new policy benefited a tiny segment of the country's 22 million people, particularly a clique of regime-linked businessmen and the mostly Sunni merchant class in Aleppo and Damascus, who have largely stuck by Assad. But the policies also triggered steep price increases that reduced many Syrians to poverty, particularly among the country's broader Sunni majority. For much of the uprising, Aleppo largely remained on the regime's side, with little rebel activity. The city's businessmen could use their influence, threats and payoffs to make sure of that  with tens of thousands on their payrolls and the countryside dependent on them. What few anti-Assad demonstrations that did take place early on came from the dormitories of the University of Aleppo, home to students from rural parts of the province. Then the rebels from the countryside launched their surprise attack on the city in July. They moved into its impoverished, mainly Sunni districts, where residents are mostly of rural origin. They have since used those areas as their base from which to wage their bid to take over the city. To this day, all of Aleppo's rebel-held areas are poor, while the city's affluent parts remain under government control, with life there reportedly continuing much as it had before. Once inside the city, the ranks of the rebels swelled with Aleppo volunteers bitter over their poverty. Mohammed Al-Ali, 25, is one of them. Just back from a two-day stint on the front lines in Aleppo  "the enemy was no more than 15 meters away from our position," he said  Al-Ali is fighting as much for social justice as for freedom. In a blue tracksuit and tennis shoes, he spoke of a father with a meager pension of $200 and a family so poor he had to drop out of school and take various jobs in shops to make ends meet as prices skyrocketed across Syria in the past decade. "We sold everything in the house that we did not absolutely need," Al-Ali said. Besides being a fighter, he earns a monthly wage of $80 as a helper in a field hospital. "I am hoping that when this is over, I will go to university and study Arabic literature. This is my dream," he said. The rural fighters also bring with them their more fundamentalist religious outlook, which the trauma of war has only deepened. Most rebels in Aleppo wear beards, a hallmark of piety, and their conversation is filled with verses from the Quran or sayings attributed to the Prophet Muhammad. They frame the fight in a religious context and speak of martyrdom as something they wish for. They often trade stories of miracles showing God's support for them. Waiting at a field hospital as one of his fighters was treated for shrapnel wounds, a rebel commander who goes by the nickname of Abu Ekrimah recounted one such tale to a comrade. The burly, bearded commander with piercing hazel eyes  his vest full of ammunition magazines and an automatic rifle slung over his shoulder  told how a long-bearded man with a reputation for piety once gave his brigade's fighters some homemade grenades. He instructed them to ritually wash themselves as if for prayers and then throw them while shouting, "God is great!" "We followed his instructions, and we could see that when we tossed them, they changed course in midair to score direct hits against the enemy," Abu Ekrimah said. "God is great!" his comrade exclaimed at hearing the story. For some of the Aleppo rebels, the war against the regime has inspired a turning point in their personal journey of faith. The rebel Abu Ahmed has images stored on his mobile phone of party dresses he once designed as a tailor working in Egypt, Lebanon and Aleppo: low-cut, strapless, see-through in parts. He says designing such revealing dresses was part of a past he has now put behind him. He also has a picture of himself with a bruised forehead and a deep cut under his left eye  what he said was the result of a beating from regime loyalists while taking part in a street protest in May 2011. He now is an ambulance driver for the rebels, who revere him for his seeming fearlessness in battle zones. "Initially, I wanted it to be a peaceful revolution against the regime, but now it is a war fought in defense of our faith," according to the bearded Abu Ahmed. It is impossible to gauge the degree of support enjoyed by the rebels in the parts of Aleppo they control. The rebels acknowledge that many residents are fed up with the hardships they endure. Regime forces punish the city daily with artillery and airstrikes. 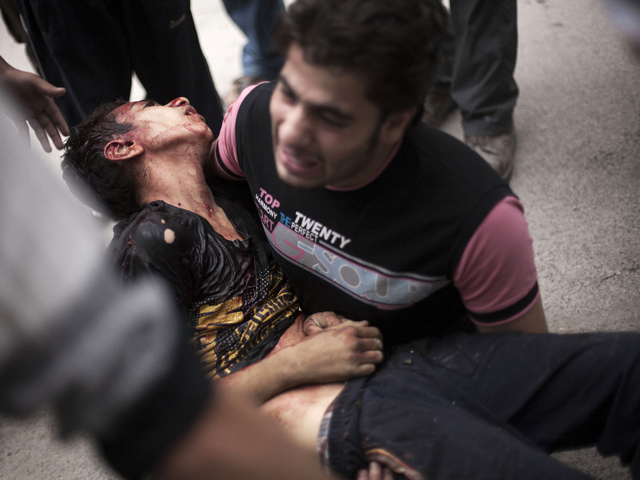 Civilians are killed and wounded while standing on bread lines, walking the streets or watching TV at home. Snipers target civilians in areas where rebels have positions. The staff at the rebels' field hospital said 80 percent of the 100-120 cases they treat daily are civilians. Even in rural Aleppo, there is a degree of disgruntlement over the impact of the fighting on the local economy. State-supported farmers' associations that once sold fuel, seeds and fertilizers no longer do so. Black market prices for the items are so high it's not worth planting some crops when the season starts in December. The fighting also almost completely shut down markets that traditionally bought their produce of wheat, barley, chickpeas and olives. "Supplies were available for the last farming season, but this season will be a very difficult one," said Mazen Aleto, a local council member in Tel Rifaat, a village north of Aleppo. "There may not be a harvest this time."